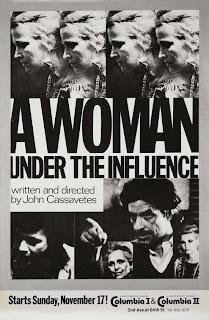 Fourth Row Center: Film Writings by Jason Bailey: Cassavetes: "A Woman Under the Influence"
Is there a more frustrating filmmaker than John Cassavetes? A Woman Under the Influence is his third film that I've seen in as many weeks, and sitting through them is often a grueling experience-- my mind wanders, I'm checking email, etc. Scenes drag and people babble and I'm not engaged, and then BLAM! Something extraordinary happens, a scene explodes, a performance pulls into sharp focus, a line of dialogue pierces the film, and I'm back with it. Was this by design, or do I just have too short of an attention span? It happens several times in A Woman Under the Influence, which is arguably his best-known and best-regarded film. It's overlong (two and a half hours) and self-indulgent, even by Cassavetes' standards; it was literally a home movie, shot in the house he shared with co-star Gena Rowlands, with their kids playing Rowlands and Peter Falk's offspring. And it slogs through many endless scenes, but then, just when you're about to give up--they get you. There's the famous "spaghetti scene," in which Falk brings his construction crew home for an early morning spaghetti dinner, and as they sit around the table and joke and jeer and sing, it turns into a variation on that endless "bar song" sequence in Husbands, but then she gets just a little too pushy, and Falk loses it, and you can't take your eyes off the screen. It's a terrific moment, and their fight that follows feels so real and unforced that you almost can't watch. So what's happening here? During A Woman, I finally figured it out. Cassavetes doesn't take anything out. Other movies abbreviate or remove the long climb that leads to those kind of emotional moments; they just give us the high points. Cassavetes leaves it all in. Does that make him a better or a worse filmmaker? That, I'm not sure of. It certainly makes him distinctive, and there's no question that these films are involving. Plus, the performances are dynamite. Rowlands' work here is noted as one of the great movie turns of the 1970s, and she is just magnificent, but Falk is pretty remarkable too. It's also got more happening visually than some of Cassavetes' other pictures; there's that amazing image of him, falling apart in the back of that truck, sharing a beer with his kids, and the quick, hard scene where he pulls her away from her homecoming party and they speak sharply in silhouette (“Just be yourself! To hell with them!”) is just right. The movie has been leading up to everything that follows, and Cassavetes (and Rowlands and Falk) don’t drop the ball; their dialogue and interaction at the very end of the film couldn’t be more perfect. A Woman Under the Influence is not an easy film to get through, but it’s got its rewards.